COLUMBUS—Columbus Metropolitan Library (CML) will kick off construction of its new Dublin Branch tomorrow, Wednesday, Dec. 6 at 3 p.m., with a short, highly visual “wallbreaking” ceremony that will include library leaders and city and community officials. The brief event is free and open to all. Parking is available in the branch parking lot. The current Dublin Branch, located at 75 N. High St., closed to the public on Wednesday, Nov. 22. CML will open a temporary Dublin Branch at 6765 Dublin Center Dr. (near the Big Sandy Superstore). The temporary Dublin Branch, scheduled to open on Tuesday, Jan. 2, will have the following hours: Monday through Thursday from 10 a.m.-7 p.m., Friday and Saturday from 10 a.m.-6 p.m. and Sunday from 1-5 p.m. The collection size will be reduced with a focus on high-interest titles. When the new Dublin Branch opens in 2019, the collection will return to its normal size. The temporary location will also offer reserve pickup, public computers, magazines and newspapers, as well as children’s programming and after-school homework help. The Dublin Branch, built in 1980 and renovated in 1990, is one of the most heavily used branches in CML’s 23-location system. 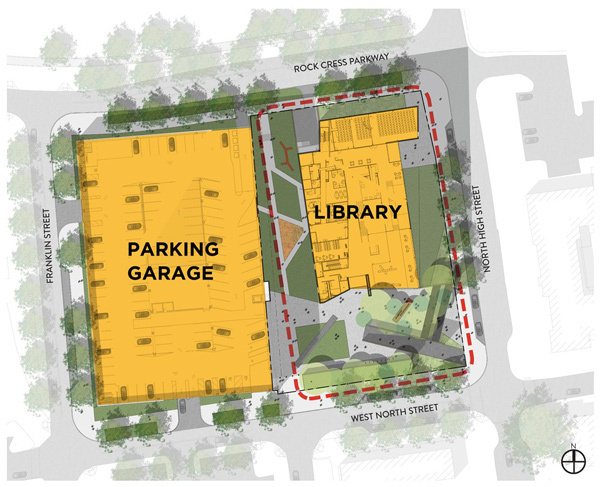 The new 3-level Dublin Branch, to be built on the same site, will double the size of the current branch from roughly 20,100 square feet to approximately 41,000 square feet. Additionally, an adjacent 4-level parking garage will be constructed by the City of Dublin with 200 spaces reserved for branch customers. CML plans to open the new Dublin Branch in 2019. Turner is the construction manager at risk and NBBJ is the architect. CML understands that great libraries create stronger communities, and each branch is an essential hub that reflects the unique needs of the neighborhood it serves. Some of CML’s 23 locations are 40 to 50 years old and inadequate to meet the demands of a growing 21st century community. Demands and expectations will continue to grow, along with the population of Franklin County. Phase one of CML’s aspirational building program is transforming and significantly upgrading seven urban branches (Driving Park, Whitehall, Parsons, Martin Luther King, Northside, Northern Lights, Shepard) and two suburban branches (Hilliard and Dublin). In addition, changes to Main Library represent a major investment in downtown Columbus and the Discovery District.